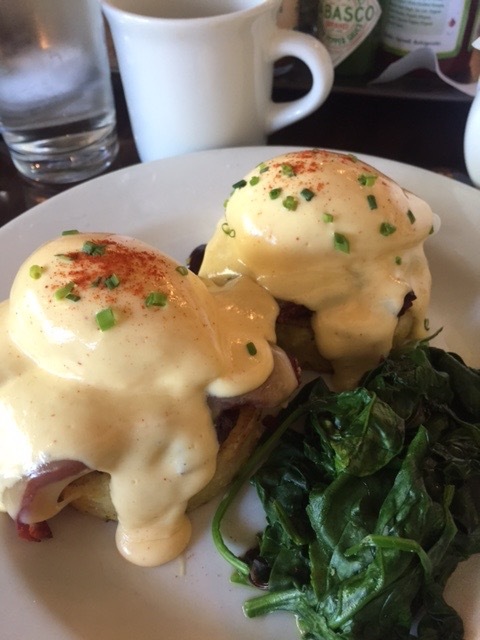 You know me and my benedicts, well Gigi’s enticed me with a weekend special of Duck Egg Benedict with Duck Bacon. I know it sounds crazy, but I was told I had to try it, so I did. It’s always the Hollandaise that either makes it or let’s the whole dish down and theirs was really well done! The duck bacon was different. The texture was not what I would have expected, in that it was actually like bacon, and the flavor was better than I expected. There was also a smoked gouda cheese and a cherry/mushroom chutney. It was all served on a polenta cake. It was outstanding and very, very substantial. If this ever goes on special again I suggest you order it. 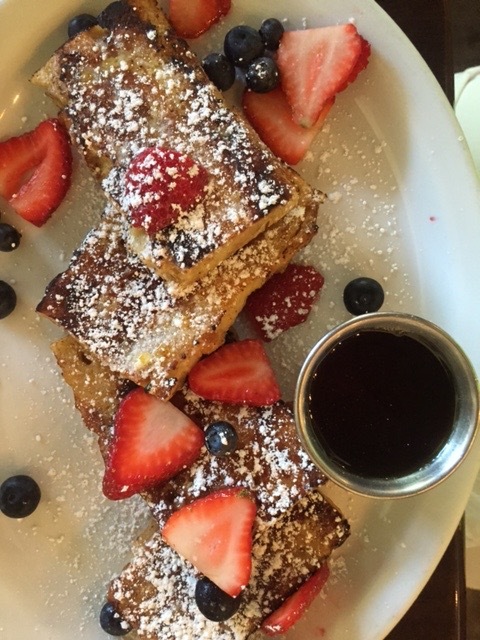 Also at our table was the Crème Brulee french toast. Outstanding! Incredibly rich with great flavor. At first you might think the serving is not that large, then you realize it’s plenty big. 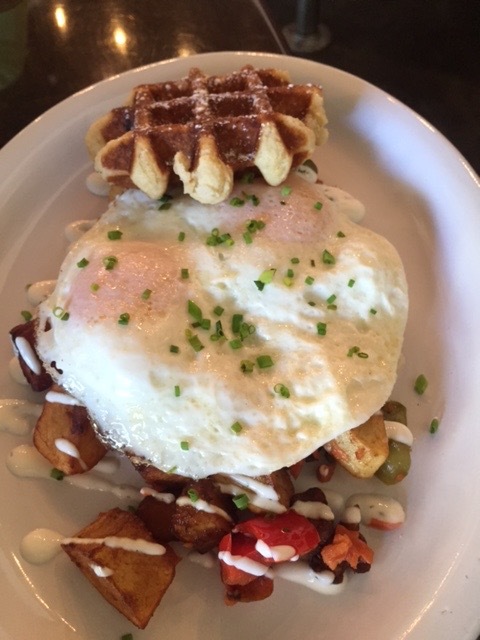 Smoked Salmon Hash with a side of Liege Waffle. Smoked Salmon Hash, which was good. Always something we look for on menus. This one comes with a Liege waffle on the side. What’s not to love about that? And last, but not least, but the Star Spangled Waffle, since we went on the 5th of July. It was another weekend special. 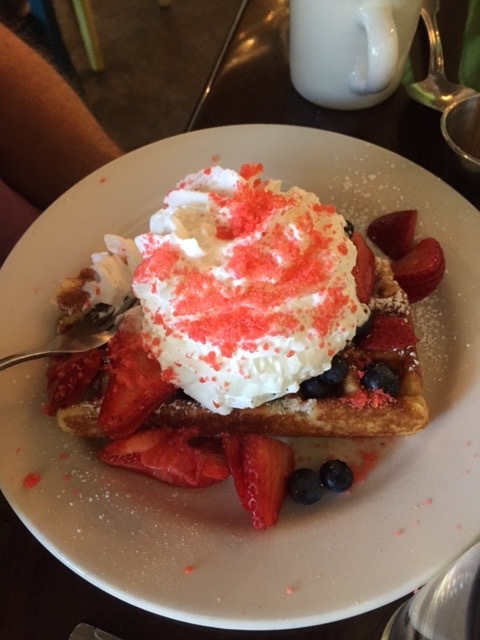 It was the Liege Waffle topped with all the fresh berries this time of year, and loaded with whip cream. It also came with a side of Pop Rocks. You take these Pop Rocks and you sprinkle them on top of the whip cream and they begin to snap, crackle and pop. We all loved the creativity and of course the waffle was delicious. Atmosphere is quite cozy in this new little shop. Lots of windows, so even if it’s a yucky day out and can be guaranteed a bright space. Price was right around $13 for entree’s and $8-$10 for Waffles. Must not miss item would be the Liege Waffles that they are known for, but their eggs benedicts are pretty fabulous as well. Gigi’s Cafe is located in SW Portland. Breakfasts that come with a waffle on the side? Sounds like my kind of joint. So funny! I work right down the street from this place and just found out about it yesterday. . . now I HAVE to try it!